Tonight the Ducks will conclude their Arizona road trip and attempt to pick up their first Pac-12 road win against Arizona State. Oregon has struggled on the road this season, dropping games to Michigan and VCU in the Progressive Legends Classic in New York as well as falling to Washington and Washington State two weeks ago. After their performance against Arizona this Ducks team is sure to come out swinging, showing us what they are capable of. No one doubts the talent that lines the Ducks bench every night, Joseph Young is second is scoring in the Pac-12 and 32nd in the NCAA. Jalil Abdul-Bassit has worked his way into the starting lineup against UCLA and Arizona, helped by his Pac-12 4th ranked .447 percentage from downtown. Jordan Bell is wreaking havoc on opposing playmakers, blocking more than three shots per game, good for 2nd in the Pac-12 and 5th in the NCAA. What Dana Altman hopes to do now is put all the pieces together in order to make a statement in Tempe. If the Ducks want to prove they deserve a spot in the NCAA Tournament in March, they need to prove they can win away from home, where they have been spectacular (71-13) since the opening of Matthew Knight Arena 2011. With only four home games remaining on their schedule, including a visit from 11th ranked Utah, the Ducks need to come up with a win not only to keep their Pac-12 record above .500 but to show they have the ability to win anywhere. 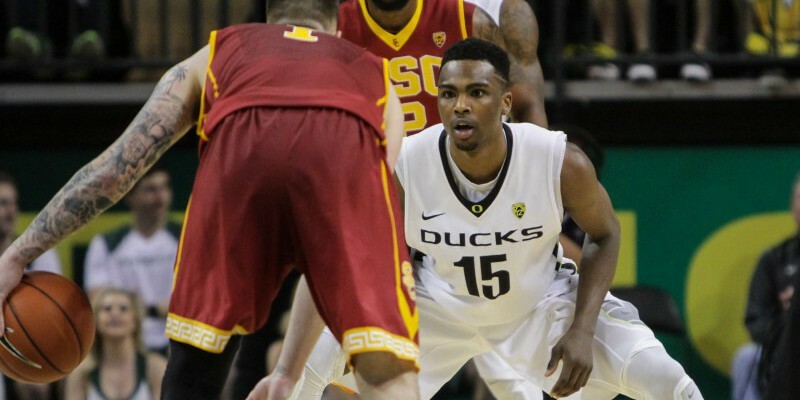 As a team the Ducks are in the top 25 in the NCAA in scoring, free throw percentage, assists and blocks. They lead the Pac-12 in scoring, as well as coming second in blocks, rebounds and three point field goals. All of the pieces to the puzzle are at hand, now it is time for Oregon to lay them out.